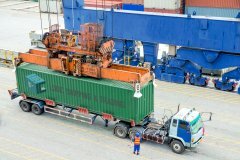 The transport of cargo in containers offers many advantages compared to other modes of cargo transportation. The risk of cargo damage is greatly minimized and the need for packaging is reduced. Furthermore, the durability of the containers and the fact that they are sealed after loading ensures a low risk of pilferage and spillage. By using containers you also get the advantage of the ISO standardization that allows them to be moved by trucks, barges, trains and container vessels anywhere in the world. This streamlining results in shorter turnover time in the handling and shipping process as almost every manufacturer, terminal and port has the needed equipment to move containers. With the increasing focus on environmental issues it is also important to note that by focusing on transport via short sea and overseas container vessels you play an important part in reducing exhaust gas emissions. Compared to truck, rail and air then transport by sea leads to a significant decrease in emissions per ton of cargo. For almost any kind of cargo you want to move, there is a suitable container for it. Logic Shipping and Trading has access to a wide variety of containers from standard dry cargo containers and refrigerated containers to tank containers and other special equipment. Should you wish to use your own containers that is also possible. We are always ready to offer advise regarding container sizes and special requirement and we have the knowledge to setup efficient and fast multimodal transports worldwide.